Create a welcoming floor plan with seating options that increase aesthetics and the overall guest experience by adding X1 Bar Height Tables. 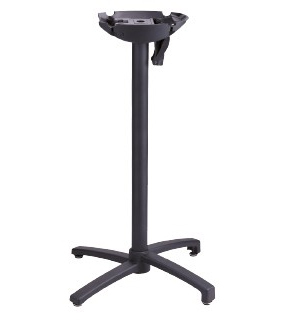 Convenient design with a patented folding system, the 42.5" tall X1 Base 100 has a large lever to smoothly adjust the top and features weighted legs that nest together when table is folded. Made utilizing reinforced aluminum fiberglass materials and finished in a powder-coat, helps ensure long lasting performance under tough conditions in high volume atmospheres. The exclusive combination of X1 Bar Height Base 100 and 24" x 32" HPL French Touch square tabletops make a fantastic addition to patio, café or party settings.